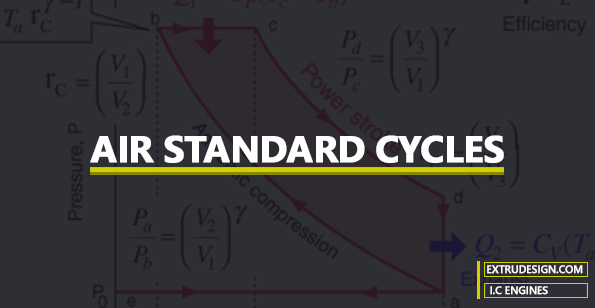 What is an Air Standard cycle? What are the assumptions for the Air Standard Cycle? We have been discussing the different internal combustion engines. Analysing these internal combustion engines processes such as the Suctions, compression, combustion and exhaust are not an easy task. So this analysis is complicated with the real thermodynamic cycle. We have to make this cycle idealised by a few assumptions in these processes. Wich is idealised cycle it will be easy to analyse these processes. This idealised cycle is called the air standard cycle. So that we can say, these Internal Combustion engines are work on the principle of the Air Standard Cycles. The internal combustion engine works on the sequence of separate process intake, compression, combustion, expansion and exhaust. These processes do not operate on thermodynamic cyclic because it involves an open system. The working fluid (fuel and air mixture) enters into the system in the intake stroke and leaves it in the exhaust stroke. So clearly the working fluid is not completing a cyclic process. To analysis this system the first consideration is that the cycle is assumed to be a closed cycle where the working fluid brings at initial condition by injecting the new charge and exhausting combustion particles. This is the main assumption. Along with this assumption, there are other important assumptions are there. Those are listed below. The remaining assumptions are as follows. The working fluid is assumed to be a perfect gas. There is no change in the mass of the working medium. All the process that constitutes the cycle is reversible. Heat is assumed to be supplied from a constant high-temperature source and not from chemical reaction during the cycle. Some amount of heat will be rejected at the constant low-temperature sink during the cycle. It is assumed that there are no heat losses. The working medium has constant specific heats throughout the cycle. With all of these assumptions, it is easy to analyse the different processes in the cycle. The performance such as the work output and the peak pressure and the thermal efficiency of these air standard cycle is the maximum. We have discussed what is an Air Standard Cycle, and why do we need to make the assumption to consider the air standard cycle to analyse the different processes in the cycle. Please let us know your thought in the comment section below.